We have another great review for you today from Grapevine Studies. You can also read some of my past reviews and ways we've used them before here and here. We love their studies! I am a doodler by nature so this fits right up my alley. My daughter is pretty artistic yet she absolutely loves these studies too. 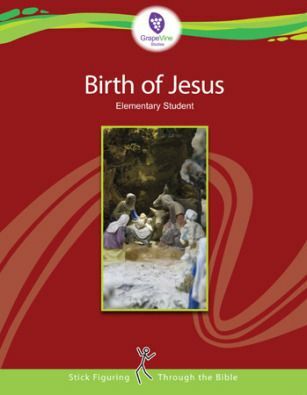 We were sent the Birth of Jesus: Multi-Level curriculum to review. The Multi-Level curriculum is for ages 8 and up. We were also given the Traceable for Multi-Level and Teacher Book. Each book came in a digital PDF download. This book has 4 lessons, timeline, and a final course and timeline review. The Birth of Jesus: Multi-Level book begins with the genealogy of Jesus, an introduction to His parents, and takes you through their journeys from Nazareth, Bethlehem, Jerusalem, Egypt and back to Nazareth. 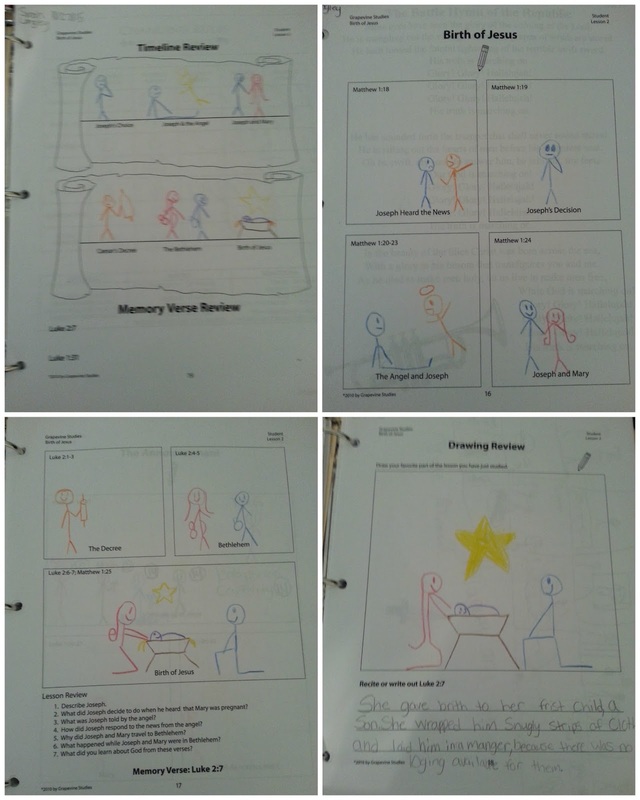 The Teacher Manual gives you sample drawings of what the stick figure scenes should look like in each lesson. 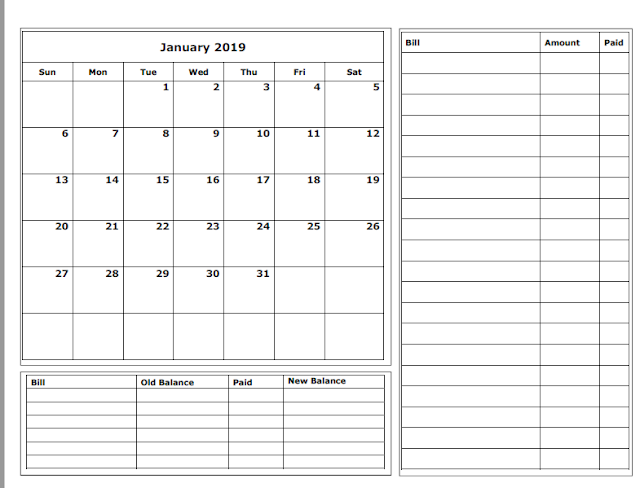 It also includes map and timeline keys, suggested daily and weekly schedules, goals for the teacher and student, supply lists, teacher narratives, Bible verses, and words to look up in a Bible dictionary. I used the Teacher Manual 2 different ways. Since we are doing a lot of car schooling, I printed out the teacher sheets as samples for my daughter to look at after we discussed the lessons. 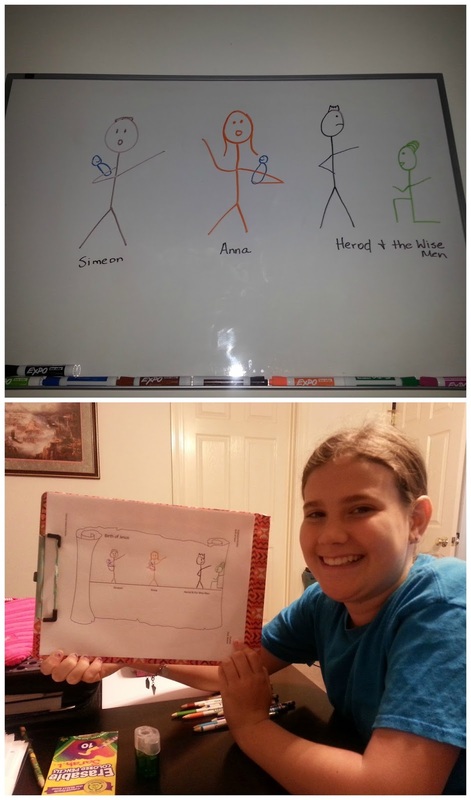 When we were at home I drew the lesson on our white board and she copied from there. Each lesson gives you a goal section, scripture read aloud, sample of what to draw, map activities if applicable, and Bible dictionary words if applicable. At the end of the 2nd lesson page are seven discussion questions to review your weekly work. Below is what the daily schedule looks like. It is very simple and quick to complete each day. Day 1 - Timeline Review - each week after week 1 begins with a Timeline Review of the previous lesson learned. At the end of the 4 lessons is a final course review of 28 questions including reciting the memory verses learned. 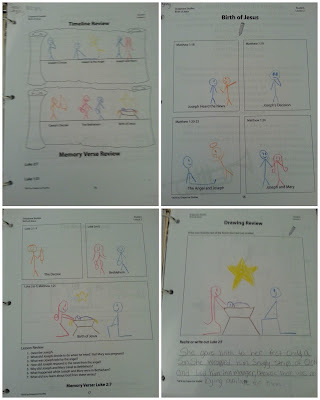 There is also a final course timeline review where all the stick figures learned are then drawn on timeline pages. I was really impressed that Sarah remembered every one of the reviews including the Final Review given at the end. 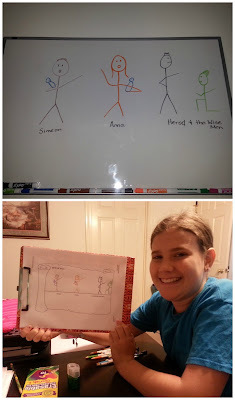 She correctly drew their stance (ie...kneeling, standing, etc. ), their color (ie...Mary pink, Joseph blue, etc. ), and any symbols included in the lesson (ie..stars, staffs, scrolls, etc.). She is very familiar with the birth of Jesus but I was still so impressed! The review that is incorporated each week into the lessons really helps the material stick with the student long term. We also received the traceable version of this ebook recommended for ages 3-6. I teach a PreK Sunday School class each week so I thought it would be fun to see how these lessons worked for them too. The traceable images give them guidelines to use making it easier for them to draw the stick figures. I have multiple personalities in my group so some did really well tracing and some just used them like a coloring sheet. Regardless, the images were there and they did really well knowing who was who and reciting back the details of each one. Again, I was so impressed! I think the color coding really helps preschoolers decipher the facts more easily as well. 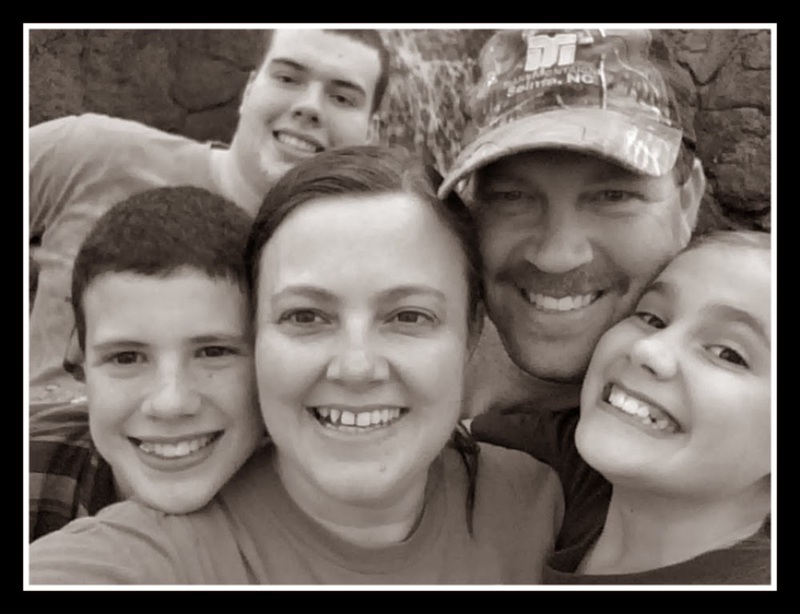 These are great resources to teach the Word of God and our family would highly recommend these resources to other families. We were given this set but have purchased our own in the past and will continue to do so. I will also be adding them in to our Sunday School lessons more often now too! It is such a blessing to find a resource that makes teaching another generation of little ones about God's Word so easy! Thank you Grapevine Studies! You can also find them on Facebook, Twitter, Pinterest, Google+ and Periscope as @Grapevine Studies. 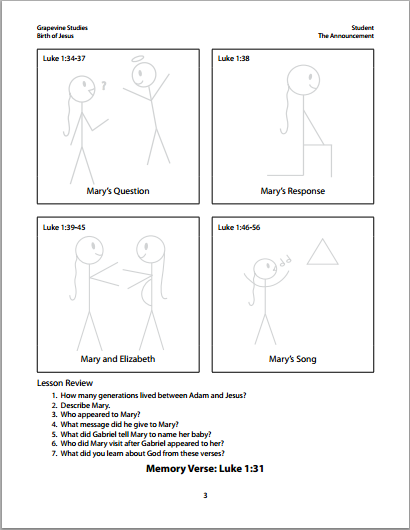 Grapevine Studies integrates stick figures, colors, words, and symbols to teach students about the Bible in all of their studies. You can choose by level, topic, or bundle. They have levels to accommodate PreK and up. Be sure to click the banner below to see what my crewmates thought about this and the other resources available.